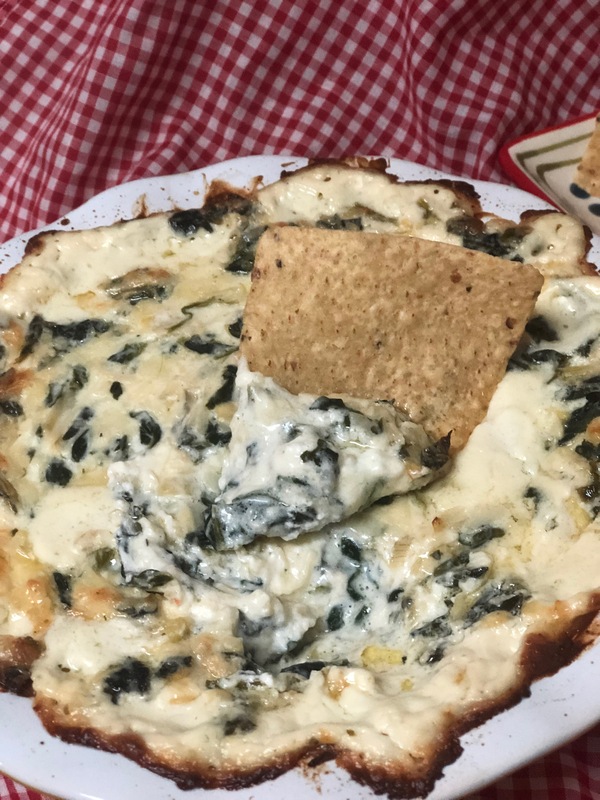 I had my girlfriends over last Friday, and I made this Spinach Artichoke Dip for us to snack on while we drank wine, and it was fantastic! As we were snacking on it, I realized that it would make a great appetizer for the Super Bowl tomorrow, and wanted to make sure that I shared it with you right away! 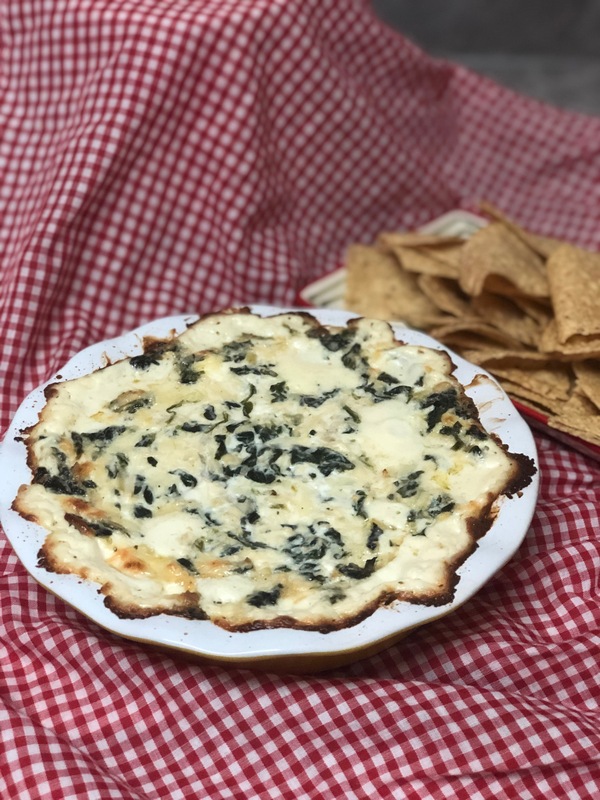 Like most of my other recipes, this Spinach Artichoke Dip is super easy to make, and it’s super versatile. I used the leftovers and made a Cheesy Chicken Spinach Artichoke Bake (recipe coming soon). This is one of those classic recipes that just everyone seems to love. To make it, you mix all of the ingredients together in a big bowl, transfer it to a baking dish, top it with even more cheese, bake and try to resist the urge to eat it and burn your mouth while you’re waiting for it to cool down. I serve this dip with tortilla chips, but you can serve it with a toasted baguette, crackers, pitas, or even fresh vegetables… maybe I’ll have to find a way to sneak this into my snack stadium tomorrow! In a large bowl, combine cream cheese, sour cream, greek yogurt, cream, dijon mustard and garlic with a whisk until smooth. Stir in parmesan cheese, 1 cup mozzarella cheese, gruyere cheese, spinach, artichokes and black pepper. Pour into a 9” pie plate and top with remaining mozzarella cheese. Bake 20-25 minutes, until bubbly and cheese starts to turn golden brown.